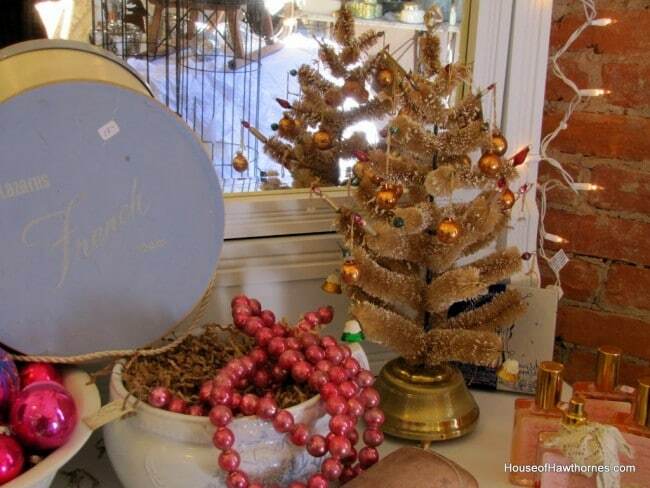 A little over a week ago, I went to a holiday open house at Urban Farmhouse in Thornville, Ohio. Thornville is a bit of a drive for me, but I like to get to Urban Farmhouse every few months as a sort of reward for myself. 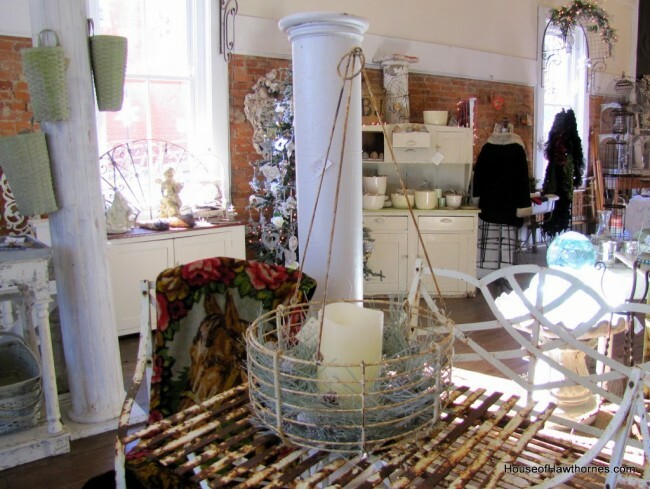 It’s a store full of eye candy and a relaxing way to spend an afternoon. And, be still my heart, they have Shiny Brites! Lots and lots of Shiny Brites! 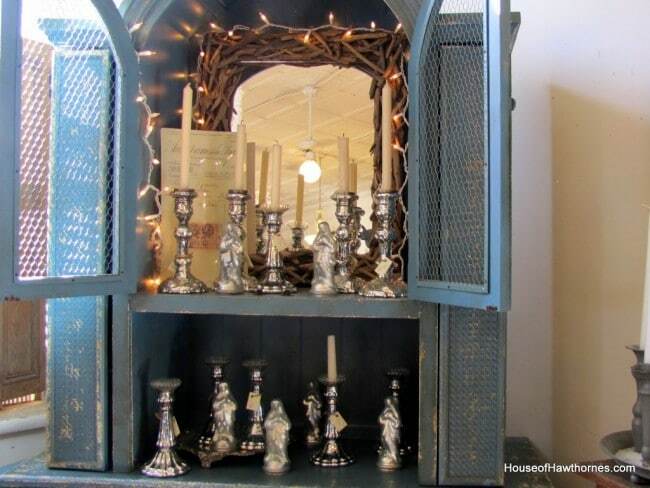 And the most beautiful understated displays that I just want to pick up and plunk down in my house. I want that green cabinet. I have no idea what these round hangy things are, but they are gorgeous. I seriously thought about buying one, but couldn’t, for the life of me, think of a place to hang it. And that’s my new rule. 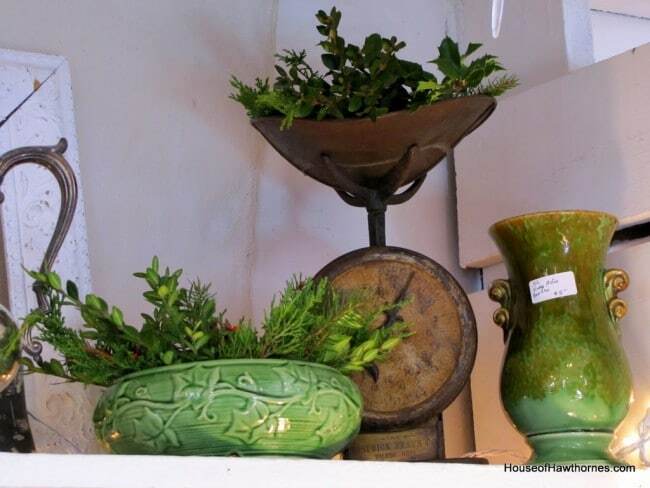 If I can’t instantly think of the perfect place in my house to put something, I cannot buy it. Let’s see how long that rule lasts. It lasted about 5 minutes until I came across this absolutely stunning vintage music box Christmas tree. I lost my mind when I saw that and it wanted to come home with me so badly. But alas, it stayed at the Farmhouse. 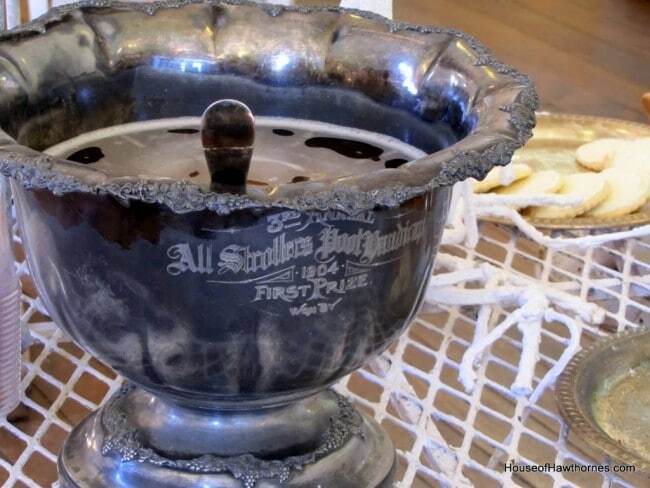 Do you think they would have minded if I dumped the punch out of this 1904 trophy punch bowl and took it home with me? It was an open house, so they had cookies and punch set out. But who can eat when there is so much shopping to do? OK, I’ll be back next time with the second half of my tour of the store. BTW, I am not being compensated in any way for writing about Urban Farmhouse. 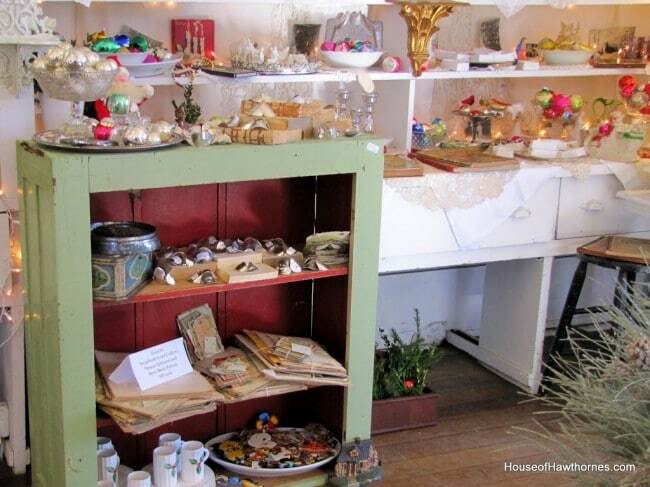 I just love their store and thought you might enjoy a tour of all the holiday goodness. Plus this girl isn’t even remotely decorated for the holidays yet, so this is as close to Christmas decor as it’s going to get from me right now. 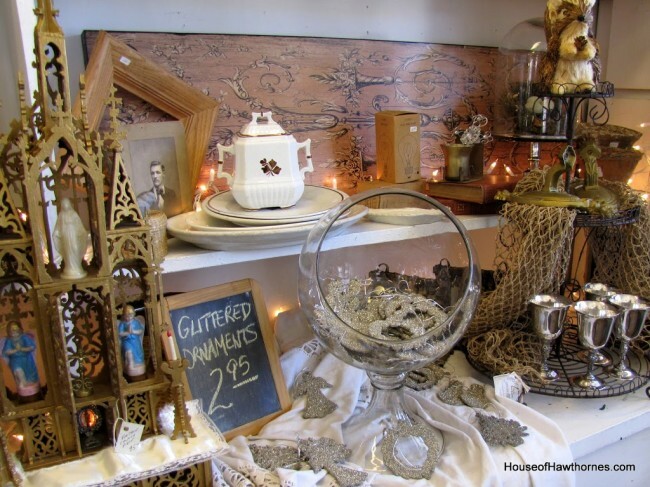 Pam I love Urban Farmhouse! So jealous you got to go, I visit their site all the time, such amazing items! Thanks for the personal tour! 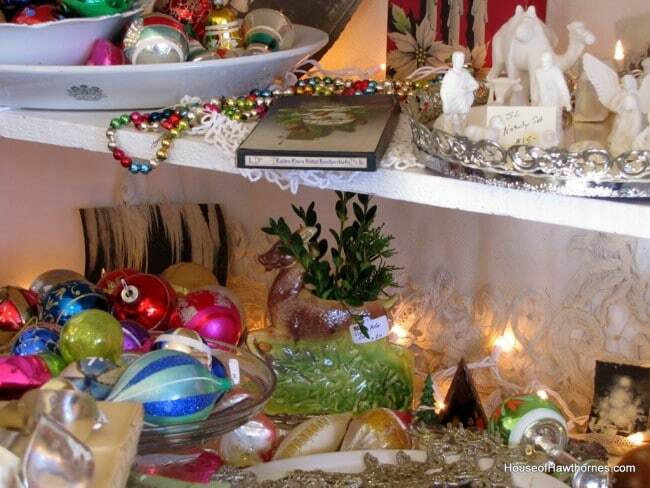 Oh, look at all the vintage ornaments! How pretty. My dad just got a bunch of Christmas ornaments from my grandpa, including some glass bead garland. Do you think it’s mercury glass? I don’t know much about that sort of thing. Anyway, maybe that round hanging thing is a plant holder. Wow, looks like there was a lot of fun stuff to buy! I would have had a blast, I’ll bet you did! I would drive there too! I need to put your rule in place! Thanks for the window shopping! Cool shop. We’ll have to check it out. Cant say I blame you for loving it. I want that French hat box. the “hangy thing” is a out door flower holder..I have one similar I bought a few years ago and I had never seen one before, have a hanging basket outside my cottage. Such a fabulous place to visit. Serious eye candy. Thanks for bringing us along. Looks like my kind of place. I LOVE vintage anything. And all those bulbs are pretty. The Golden Tree music box was wonderful. Great photos. Take care. 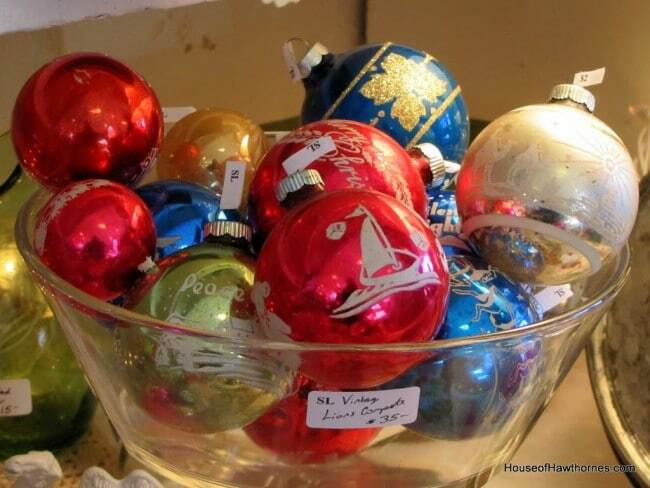 OMG that bowl holding the $2.95 glittered ornaments…I would have had to try and make them a deal on that!! This place looks wonderful! 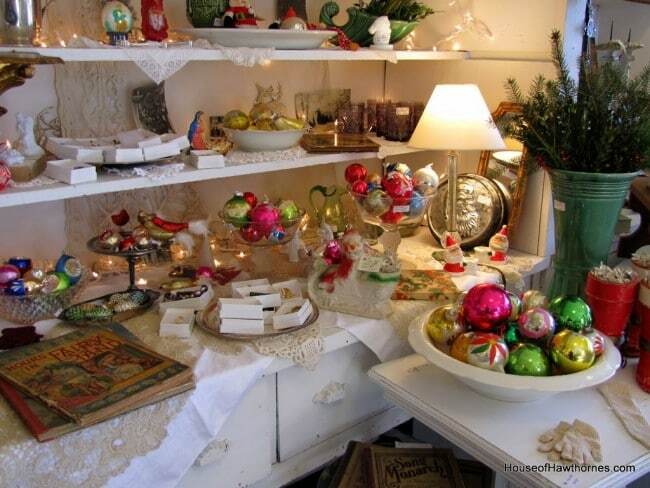 That shop is just full of pretty things..how lovely! 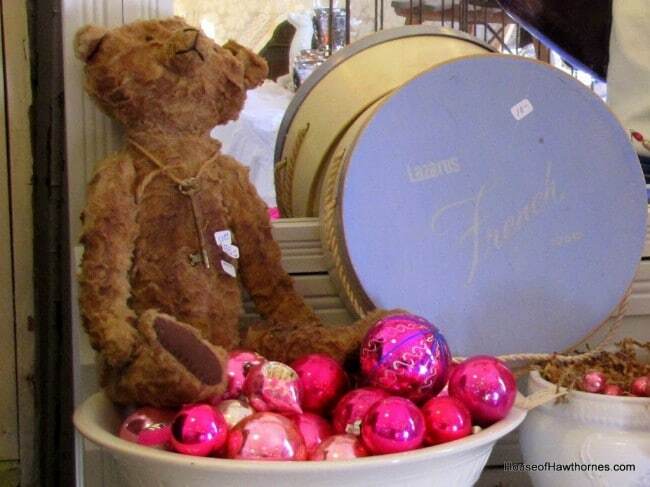 I just love the colourful vintage baubles on display. I try to follow the same rule as you, only to buy things, that I know there will be a place for at home (I did put ‘try’ though..sometimes I can’t resist something and have no clue where to put it :P).